where COSOMC..PATH is the full path of wherever you installed CosmoMC. If you have problems on a Mac or need to install python, see Installing Python. Scripts for plotting and analysing are described below. See also grid scripts and GetDist GUI documentation. 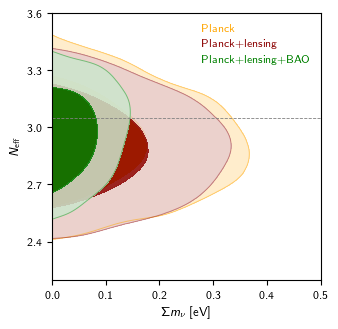 For plotting from Planck chains see the Planck readme for how to download and install. This page gives a few simple examples to get you started with plotting from Planck of CosmoMC chains. For more detailed documentation of the full plotting and sample analysis API see the GetDist documentation. 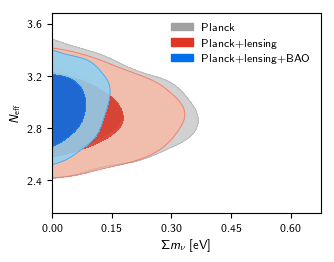 The getdist.plots module (directly, or via planckStyle) is used to make plots from chain results using your own custom scripts. See sample scripts in batch2/outputs, the Plot Gallery and tutorial, and the full GetDist documentation. Note that if you have installed CosmoMC, you don't need to separately install the GetDist python package. The GetDist program can be used to get means, variances, limits etc from all parameters in a chain. The python scripts allow you to do this dynamically, and also offer additional features such as being able to define new derived parameters. Here p.omegam is a vector of parameter values, similar p.sigma8; samples.mean and samples.std sum the samples with the corresponding weights to calculate the result. See python/getdist/chains.py and python/getdist/mcsamples.py for other functions you can use. Use GetDist or mcsamples.py if you want to reproduce Planck results. The mcsamples module gives you code access to most getdist results, and an MCSamples instance can be obtained from a grid as above, or you can load a chain file directly. which tells you that ΩmH02.92 is constrained at the 0.3% level. Samples can also be loaded directly from single chains, optionally with custom settings, e.g. Or from a grid or list of directories you can find chains automatically e.g. After doing this, you can use 'rsH' as you would any of the original parameter names in the chain. If your new parameter has a hard boundary, set the range parameter for addDerived with the [min, max] bounds. where sample_points is a matrix of sample values, names are the parameter names (list of strings), and loglikes is (optionally) an array of corresponding -log(likelihood) values. Instructions below are for installing python to run things natively on your machine. You could also use CosmoBox. See the Python 2.7 download, or install a package like Anaconda (Python 2.7 or 3.4+). Also install matplotlib and PySide standard packages using standard methods (usually included by default in Anaconda), or download builds from here. Install MacPorts, following the instructions on that page (including installing XCode and command line tools first). Check that python --version says the correct latest version. If not, edit your system path to remove other python installations. While not needed for GetDist/Cosmomc scripts to run, you may also find an integrated development environment like PyDev or PyCharm useful (they are similar, the latter usually better). This will let you run in one click, check syntax as you type, format nicely, etc.